When we pick our coffee makers, we mostly focus on things like the price, design, and types of coffee it makes – but we rarely stop to think about the less obvious things, such as filling the tank and maintenance. As it turns out, though, it’s those little inconveniences that eventually lead us to start hating our coffee makers the most. So, today, we’ll switch things up a bit, and focus on finding you the best coffee makers with removable water reservoir – and you’ll quickly learn why! Why Does A Removable Reservoir Matter On A Coffee Maker, Anyway? What’s so amazing about removable water tanks, anyway? Instead of filling a pitcher with water first, and then pouring it into your coffee maker's reservoir, you can skip all that and fill up the tank directly. Trust us; it’s way more convenient that way. 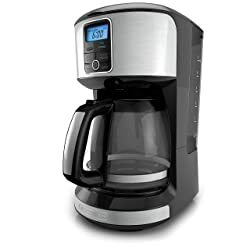 A built-in water tank seems like a good idea until it’s time to clean it, and you realize your only option is to rely on the unit’s descaling program – that’s pretty much all you can do, anyway, because getting the entire coffee maker wet is not an option. If you opt for a removable water reservoir, though, you can quickly clean it whenever the need arises – and in most cases, it’s as simple as popping it into the dishwasher! If there are fewer things to mess with, there’s less chance to mess things up! So, if you ditch the pitcher out of the equation, as suggested above, you won’t have to worry about accidental spills – and that’s always a plus if you ask us! Now that we’ve established that a coffee maker with a removable water reservoir is something worth having on your kitchen counter let’s see what the market has to offer! If you want to bring out the best in your coffee grounds, you should consider getting yourself a Mr. Coffee – the brewing temperature of up to 205 degrees Celsius promises not only faster brewing times, but richer, more flavorful coffee, as well! 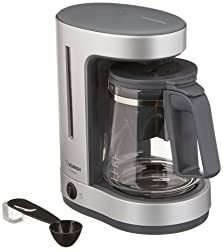 Oh, and on top of that, thanks to the Delay Brew, one of the unit’s many handy programmable features, you also get to wake up to freshly brewed coffee waiting for you in their signature Just-Brewed thermal carafe. If you want functionality and convenience, this Cuisinart DCC-3000 is a perfect fit for you! And yes, it’s fully programmable, too, which means you have the option to set the timer according to your daily routine and coffee drinking habits and have your coffee hot and ready-to-serve right when you need it most. 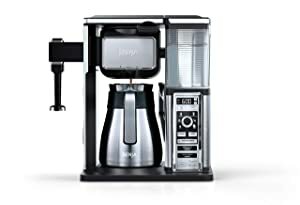 Plus, it has an impressive 12-cup capacity (on its reservoir, this is a coffee maker without carafe) – ideal for households with several coffee drinkers, offices, parties, and family gatherings! Okay, you can’t have a round-up of the best coffee makers with removable water tanks – or any other kind of coffee makers, for that matter – without a Keurig model in it. Featuring an extra-large easy-to-navigate color touch screen makes the entire coffee brewing process stress-free – and fun, even. 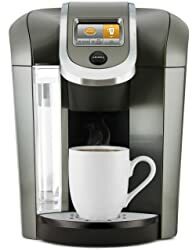 And when you factor in the programmable features and customizable brewing settings, this Keurig model becomes virtually unmatched regarding user-friendliness and convenience! Oh, and did we forget to mention that the reservoir glows in the dark, too? So far, we’ve had some relatively affordable models, but if you’re ready to spend the big bucks on a premium coffee drinking experience, look no further – the Ninja Coffee Bar Auto-IQ might be the perfect coffee maker with removable water reservoir for you! With six available brew sizes, a built-in milk frother, and five brew types to choose from (including a full-bodied Café Forte), you can have all the benefits of visiting a coffee shop – without ever leaving your kitchen! Looking for a premium coffee brewing experience at a reasonable price? Well, look no further – this Zojirushi coffee maker might be what you’re after here! Its 5-cup capacity hits that perfect middle ground between a single-serve and a sizeable 12-cup carafe, ideal for households with only one or two coffee drinkers. Once the brewing process is over, your coffee will stay warm for up to an hour for maximum flavor and convenience. Plus, it’s surprisingly compact – and that’s always a plus when it comes to kitchen counter space! Remember what we said about round-ups of the best coffee makers not having a Keurig thrown in them? 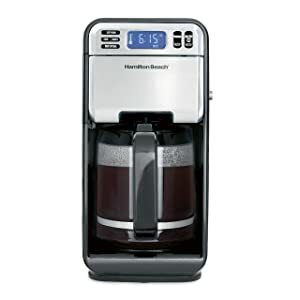 Well, the same goes for Hamilton Beach – their coffee makers continue to be the consumer’s favorites for years now! It’s not only affordable but surprisingly user-friendly, as well. 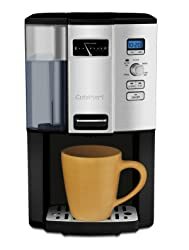 From easy filling and programmable features to customizable brewing options and mess-free serving, this coffee maker does all the hard work for you. All that’s left for you to do is to enjoy your cup of coffee! If you’re frequently travelling and need a trusted companion to handle your coffee, you should probably look into single-serve coffee makers. Better yet, check out this CHULUX model – a compact, little unit with user-friendly one-touch controls. And while it doesn’t allow you to set a timer, it does make up for it by brewing a cup of coffee (even a travel-sized mug, if that’s what you prefer) in under three minutes, and then shutting off automatically once it’s done. It looks like your average coffee maker until you take a closer look, and realize there’s nothing average about it. For instance, if a regular-sized carafe doesn’t quite cut it for you, you’ll love this KitchenAid’s massive 14-cup capacity. Yup, you read that right – it brews 14 cups at a time! And it doesn’t end there, either – you can set a timer according to your schedule, choose your brew strength, and keeps your coffee at the desired temperature for up to four hours. Although it costs a bit more, the Capresso coffee maker is worth every penny – especially if you prefer a thermal carafe over a glass one. The unit features a 10-cup capacity which brews in less than seven minutes – do the math, and you’ll see that’s less than a minute per cup! Talk about the rapid brew, huh? Of course, it has a full set of programmable features, along with something called the “Gold tone filter” – if you’re interested in ditching paper filters for good, this one’s perfect for you! 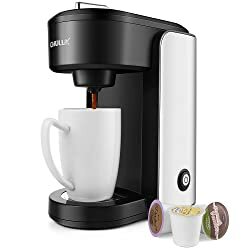 The last spot on our round-up goes to a Black+Decker coffee maker with an impressive 12-cup capacity – a model that’s all about making the process of brewing coffee for larger groups of people as easy as possible for you. Set a timer according to your daily routine, choose the desired brew strength, and you can have a full carafe waiting for you whenever you want. And if you’re short on time, the Sneak-a-Cup feature will allow you to pour that first cup even before the brewing process is entirely done! 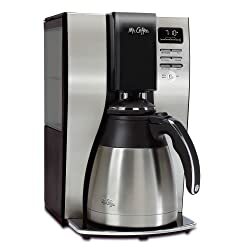 Okay, they all have a removable water tank, which is convenient and all – but we both know there’s more to picking the right coffee maker than that. Take a good, hard look at your coffee-drinking habits, and figure out whether you need a single serve coffee maker or a large, 12-capacity one. It gives you the option to pre-set everything for a grab-and-go experience. 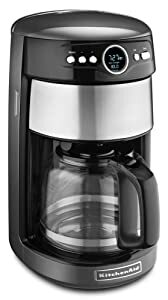 If, on the other hand, you tend to brew your coffee and completely forget about it, you should look into models with a thermal carafe – these will keep your coffee hot and flavorful long after it’s done brewing. Lastly, ask yourself how much you’re willing to spend on the best coffee maker with removable water reservoir, set an appropriate budget – and, most importantly, stick with it. So, which one of these is the best coffee maker with removable water reservoir? We’d say it’s the Keurig K575 Single Serve K-Cup – coming from a reputable manufacturer, it’s been a kitchen staple for years now, and it never seizes to amaze us with the convenience it brings to the table! Do you have a personal favorite, too? Let us know in the comments below!